The FOXSAT-HDR is an award winning twin-tuner Freesat digital TV recorder (DTR), bursting with Freesat recording features to capture the incredible colour, sound and crystal clear images of HD channels from the BBC and ITV. Remote is included as seen in the photos. All working and in good condition with a few scratches on the item mainly on the top as seen in the photos though nothing hugely significant. One larger scratch near the back of the box which I have taken a close up of. The Freesat box pictured. Conditons of sale. zones 2 & 3. Cash on Collection. Fully working sold as 320gb as not sure if a 500 or 320gb. Remote included with part used batteries. New listingHUMAX HB-1000S Freesat HD Smart Digital Satellite TV Receiver !!FREEPOST!! Condition is Used. Max.4000 Channels. (TV & Radio Programmable). A very trustworthy receiver with basic features. MPEG-2 Digital & Fully DVB Compliant. Capable of inserting Max. 1000 PIDs of Video, Audio and PCR and SMATV system. Get more out of your TV viewing with the Humax HDR-1100S Freesat HD Smart Digital TV Recorder, which gives you a subscription-free way to watch and record more than 200 TV and radio channels, with 11 available in HD. • 190 channels including Free HD Channels. • On Demand TV including BBC iPlayer, ITV Player, 4oD and Demand 5. Stop Searching, start watching. Get the best of both Worlds. • Subscription free services. Works like a Sky box. In excellent working condition. Humax HDR 1100S satellite TV Recorder - Black. Condition is Used. 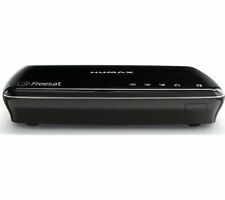 Humax Foxsat HDR 500GB Freesat Recorder Box. For sale is My Humax Foxsat HDR Freesat recorder. A correctly aligned sky dish is ideal. This is the larger 500gb hard drive version. In reasonable condition with light scratches to the top casing but nothing really bad or eyecatching. Humax Freesat HD 320GB recorder. About 7 months old, hardly used. Humax Foxsat HDR Freesat Digital PVR. Humax Foxsat HDR for Freesat - YouTube. 1TB Upgrade Hard Drive. 1TB Hard Drive. Record In HDTV (High Definition) i.e. BBC One HD, BBC HD & ITV HD. 1 x User Manual. Used Humax HB-1000S TV Receiver with all leads except the internet lead which we supplied our own as the original was poor quality,instruction (if needed will be on the internet but this is really just plug and play).This machine was used for a month and is in excellent working and cosmetic order,the only reason we`re selling as we won a years free sky tv with their system,we used this with a usb plug in hard drive which worked very well,batteries will be required for the remote and although not the original box it will come well wrapped and need a signature,no buy it now,returns or overseas bid,thank you for looking. Humax Freesat 1100s HD Box 2tb - Wifi & Netflix ready. Excellent Condition. Humax Freesat 1100s HD Box 2tb Storage - Wifi & Netflix ready. Catch up TV included plus Netflix and YouTube. Condition is Used but works fine! HDR-1000S Freesat box. The Freesat App for iOS : Available for iPhone, iPad or iPod Touch with iOS 6.0 or higher. The Freesat App for Android : Available for Android devices running Android 4.0.3 and above. Humax Freesat HDR-1000s HD recorderwith 1TB hard drive. 320GB Hard Drive. HD Recorder. Twin Tuner. Briefly function tested. Powers on and has been reset to factory settings (see FAQ’s). As the UK's number one heart charity, the cutting edge research we fund has already made a big difference to people's lives. Used working condition with no remote. 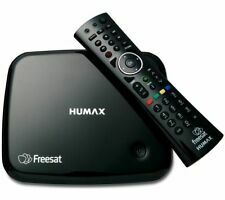 Selling one Freesat Humax HDR-1100S 500GB Wi-Fi Smart TV Recorder. Item has no signs of wear, is new, and has never been used, box has only been opened to check for damage. Please see product website for full technical specifications https://uk.humaxdigital.com/product/hdr-1100s/ Any questions please ask and please check out my other items, thank you. The Humax Foxsat HDR Receiver allows live TV to be paused and has fast forward and rewind features that work at 2x, 4x, 16x, and 64x speeds. WHAT IS A FACTORY RESET AND HAS ONE BEEN DONE ON THIS ITEM?. Condition is used but very good looks as new, will need contents deleting as cannot connect to my wall mounted tv to delete (tv too tight to wall, no fault of the free sat box). Humax Freesat HDR Box - 1010S 1TB - White. No box. Condition is Used. Dispatched with Royal Mail 1st Class. (Humax HDR-1010S 1. 1TB) DVR with Wi-Fi TV Recorder HDMI Humax HDR-1010S 1. 1TB) DVR with Wi-Fi TV Recorder HDMI. Condition is Used. It allows you to record up to 600 hours of SD files. Using its two USB 2.0 ports, you can transfer and access files from one device to the other. Humax HD-FOX TV Receiver. Condition is Used. Collection in person only. Humax HB-1000S TV Receiver with wifi adaptor enabling direct access to online tv services including catch up. Still one of the best looking and user friendly user interfaces available. Humax HB-1000S TV Receiver. Condition is Used. Dispatched with Royal Mail 1st Class Good condition,external hard drive can be attached for recording and playback . Fully working Humax Foxsat HDR 320GB Freesat viewer and recorder. The internal hard drive is capable of storing 143 hours of standard definition recordings or 35 hours of high definition recordings.